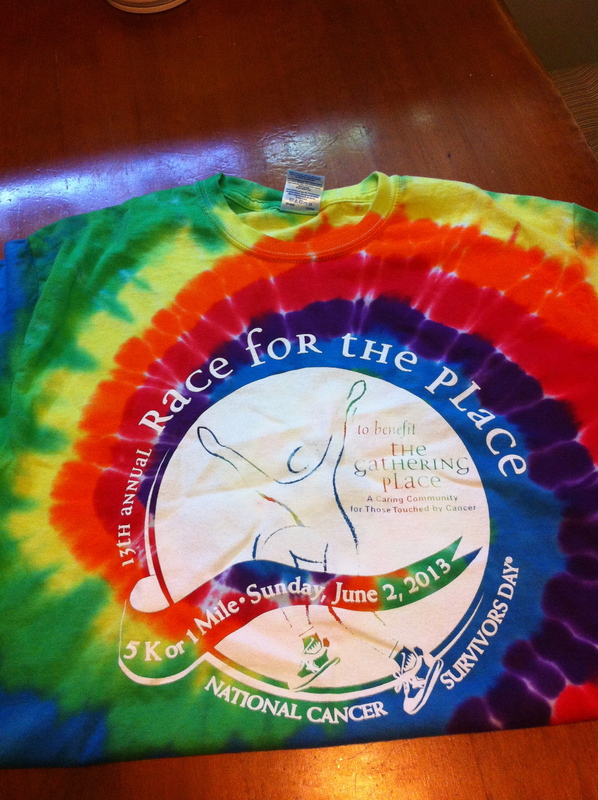 Today is National Cancel Survivor’s Day and for the past 13 years, The Gathering Place in Beachwood has marked this day with the Race for the Place 5K. 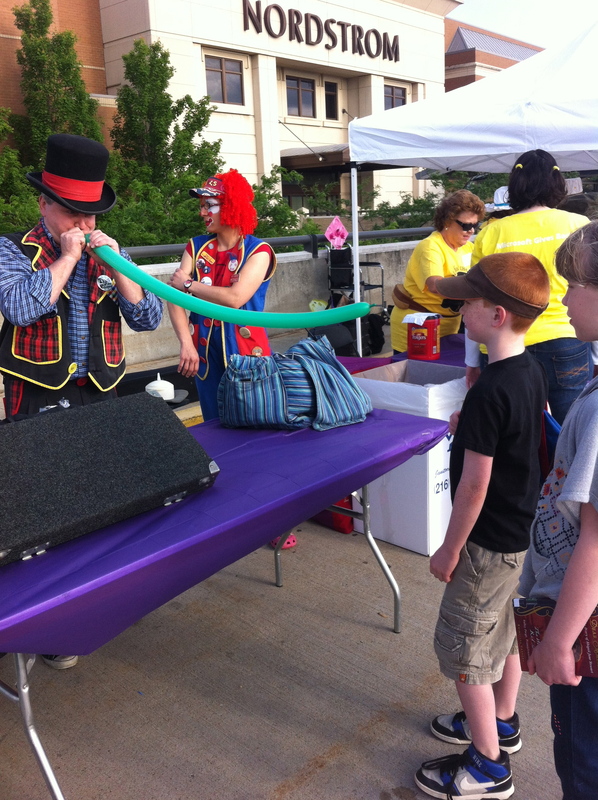 Participants can raise money in order to help fund the amazing work that The Gathering Place does and allows them to provide free services to their clients throughout the year. The Gathering Place provides assistance to those touched by cancer, including support groups, children’s programming, art therapy, nutrition and exercise classes, lectures, lending medical libraries, the new Hair Peace Wig Salons and more. I’ve participated in this race since 2010. This year I had the pleasure of speaking to Kris Austin, Director of Community Relations & Marketing for The Gathering Place. She shared with me that the race has raised over $1 million in its 13 year history and that this year, nearly 4,000 run/walk participants would raise about $350,000. The spirit of the crowd at this race is phenomenal. Teams join together to support a family member and often create their own race shirts. 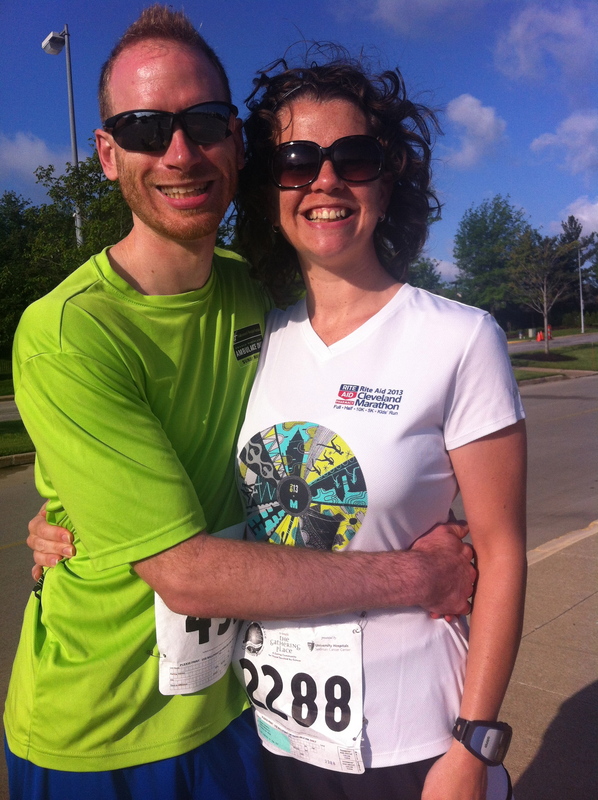 Others simply wear the awesome shirt that the race provides. This morning’s crowd was a sea of tye-dye thanks to this year’s shirt! The main reason that I love this race is the number of things my family can do while I am running it! It is difficult to find a better-suited race for parents of young children. 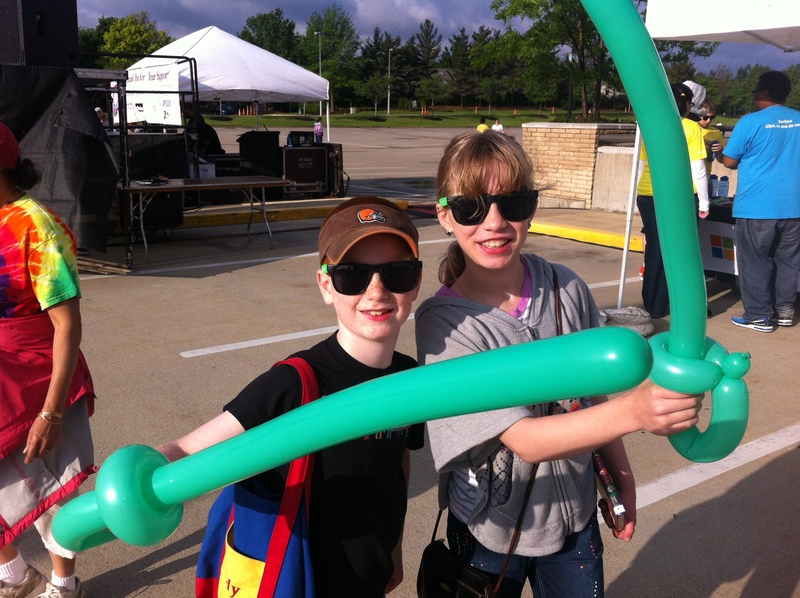 My kids have enjoyed balloon animals, magicians, face painting, giant soap bubbles, hat-making and games, all of which are featured in Celebration Village at the race. This year was no exception! Free sunglasses from sponsor Microsoft! 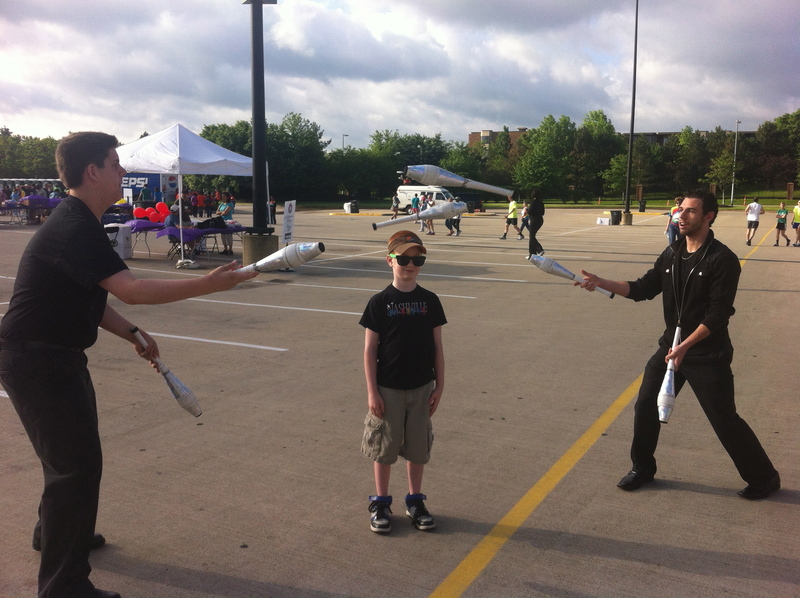 Magician David Anthony and his juggling assistant tested Brody’s trust and juggled pins over his head! This year the post-race food spread also included 4 food trucks from the area. 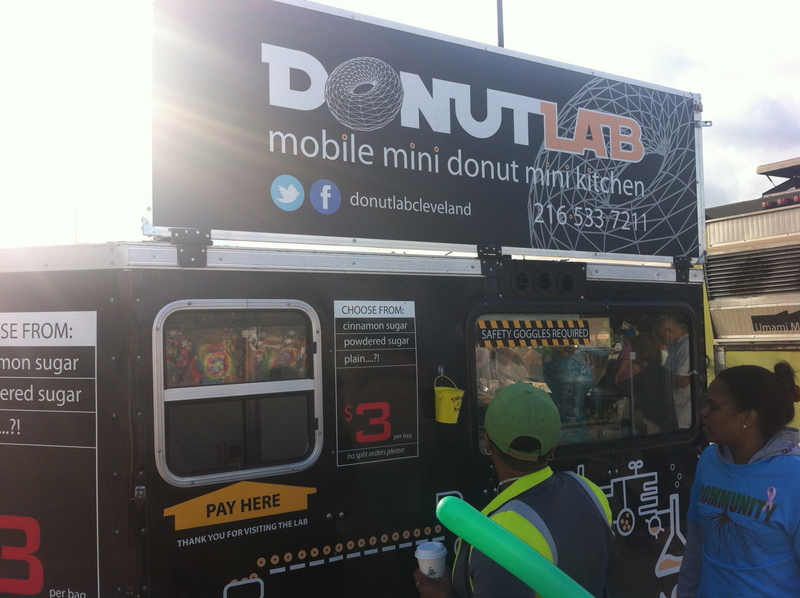 We enjoyed bananas, water and cereal bars after the run, but we could have indulged in Donut Lab treats! We arrived early for this year’s race since Phil needed to register and I needed to pick up my bib. Volunteers are stationed everywhere and we were greeted warmly and given easy directions to locate registration tables. We had time before the race started to use restrooms, entertain the kids, scope out a good location for them to watch the race, watch a troop of Irish dancers and even meet Gary, a Twitter friend that I was thrilled to finally meet in real life! The pre-race Survivor’s Ceremony included greetings from Cleveland’s Jimmy Donovan, cancer survivor, sports anchor and voice of the Browns, along with moving words from Eileen Saffran, executive director of The Gathering Place. Phil and I ran our second race together today. I went in to the race hoping to just enjoy it, not certain of what a my body could do 2 weeks after the marathon. This course begins with some small downhills in mile 1, some slight uphills in mile 2 and flattens out for the home stretch. Phil and I grabbed a quick drink at the water stop at the half-way point and walked for about 30 seconds when I couldn’t get my breathing under control. I started to think I was nearing my PR window, but decided I was better off to just ignore my watch and see if I could push through the home stretch. I was thrilled to look down at my watch at the finish and see what I thought was a 10 second PR! Later today when official chip times were posted, I was even more excited to see that it was actually 18 seconds. I realize that’s not much, but any improvement thrills me. We hung around after the race, enjoying the beautiful weather. I got to meet Kris, who was so kind and hugged me in spite of my sweaty condition! I can not say enough positive things about this race and I’m hoping that you’ll join me next year, either as a runner, a volunteer or as a fundraiser for this great cause.